Holding titles, not owning titles. We wrote the title by intent, even if it’s not quite 100% accurate, as Hagwilget has blended with Moricetown very well over the last 75 years. For the sake of what we are about to tell all of the hereditary chiefs come from these two villages. 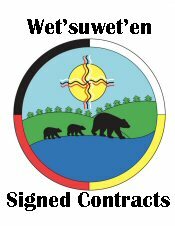 We also did not say Wet’suwet’en chiefs as that would infer they represent all of the Wet’suwet’en, and while that might have been true 100 plus years ago, it is no longer the case. The Moricetown Chiefs failed their duty to support these other Wet’suwet’en communities, so they created their own individual governments. In the past we have said there are 5 communities but there are actually 6 communities, of that 6 only 2 recognize the Moricetown chiefs as their authority. In the event of a Wet’suwet’en vote, Moricetown has less than 50% of the total vote, based on the numbers we could find today. Breaking it down further only about 40 to 45% of the population of Moricetown actually live in Moricetown, resulting in even greater alienation from the chiefs. Of those 4 who do not recognize the Moricetown chiefs as their representatives, all 4 of those communities have actively participated in negotiations with the Government of British Columbia in 2019, independently from the Moricetown Chiefs. That said its clear the Moricetown Chiefs do not have a mandate to speak for the Wet’suwet’en as a whole. Likewise the government has a mandate to protect the overall rights of all Wet’suwet’en people. One of the many reason why it’s so difficult to write about Wet’suwet’en people is finding information, and making sure it does not evolve into being incorrect before you publish. Talking directly to members requires trust that they will not become victims by their own people, for sharing factual history. Likewise many simply do not know their own history, and it’s embarrassing to admit that. Another factor is the language, those living today only a few can follow what was being said, and some have to guess based on what portions they thought they understood, and that which completely gets lost in translation. With the help of two very competent speakers in the language, we are able to share a bit more in regards to the Moricetown Chiefs, who have on more than one occasion taken advantage of the mysteries in understanding how things happen. We spoke to two separate individuals, cross examining them on what they said without revealing what the other had said, to insure we were not making more mistakes. And I have to say that both persons were very clear on what happened at a smoke feast held in Moricetown. We do not have the date, but it was one of the last times Henry Alfred spoke at a smoke feast. It is important to understand that the hereditary chiefs who spoke and gave testimony at the now famous Delgamuukw trial, have all passed on. All of the chiefs today are what we can call “next generation” chiefs, who have to some degree created completely new laws that were non-existent in oral and or written history. So for the record, based on what our sources revealed, both Adam Gagnon and Alphonse Gagnon as well as Warner Naziel were born into the Owl house. The true head of the Owl house is not Chief Kloum Khun, the true head of the Owl house is Barb Wilson. The name Kloum Khun belongs to the Sun House and according to our sources who said that Henry Alfred at that smoke feast made it clear that both names taken (not given) by Alphonse Gagnon and his brother Adam Gagnon. Let me quote verbatim so I am not accused of altering the story. It looks like they just waited until Henry Alfred passed away, and did it anyways. This explains why Warner Naziel was staking claims to the name Smogelgem more than a decade before Gloria was stripped by the Wet’suwet’en Five. As for our sources, we will protect them, for very obvious reasons, there is a serious concern for their wellbeing on account of just how violent some of their supporters are. All one need to do is follow our Uniholligans page to see this threat is real. And we really don’t even post all of the threats made in social media.